2Type your business name in the search box and press Enter. You may need to enter your street address and city to distinguish your business from others with similar names. Suppose you don’t find your business? 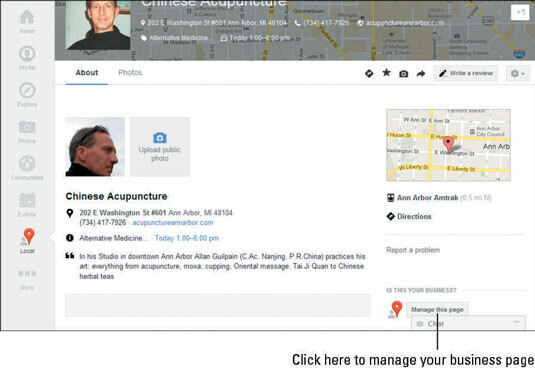 If your business doesn’t appear, go to Google Places at www.google.com/business/placesforbusiness. Search for the address rather than the business name; when the address turns up, continue with the steps. 3When your business (or your address) appears, click the red pin that represents it. A window with information about the location pops up. A Google Places page appears, with a description of your business. 5Click Manage This Page, which appears under Is This Your Business?. A page appears with three options: Edit my Business Information, Suspend This Listing, and This Isn’t my Listing. 6Click Edit my Business Information; then click Continue. 7Select the method by which you want to confirm that you are the owner or manager of the business; then click Finish. 8Make note of the PIN number and enter it in your Google Places dashboard to complete making your claim. 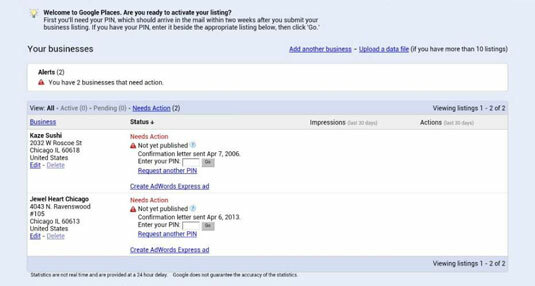 Any businesses you have submitted and claimed can now be marketed by you on Google. You can create Google AdWords ads so they get better placement in search results, for example.